the bridge from electrochemistry to biology and medicine of microscopic and molecular understanding. Summarizes the highlights of two major electrochemistry meetings. It includes research papers on the electrochemical processes in micro- and nanotechnology. 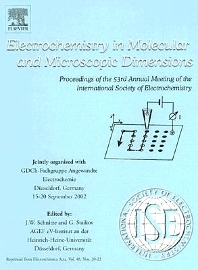 Highlights developments and advances in electrochemistry. Research Scientists involved in fundamental electrochemistry, electrode and electrolyte materials, analytical electrochemistry, electrochemical energy conversion, corrosion, electrodeposition and surface treatment, electrochemical engineering, bioelectrochemistry.